Here’s a follow-up story about Rowdy, a kitten who got a big boost up in life from Cat’s Cradle, a nonprofit, no-kill animal rescue organization located in Harrisonburg, Virginia. Rowdy, then a playful 10 week old kitten, was rescued from the pound in April 2013 by the great folks at Cat’s Cradle. Rowdy was suffering from chronic constipation with signs of nerve damage, which can occur due to physical trauma such as being struck by a car. After a successful fundraising drive by Cat’s Cradle, Valley Veterinary Hospital in Harrisonburg performed lifesaving surgery and Rowdy has been under foster care there since. 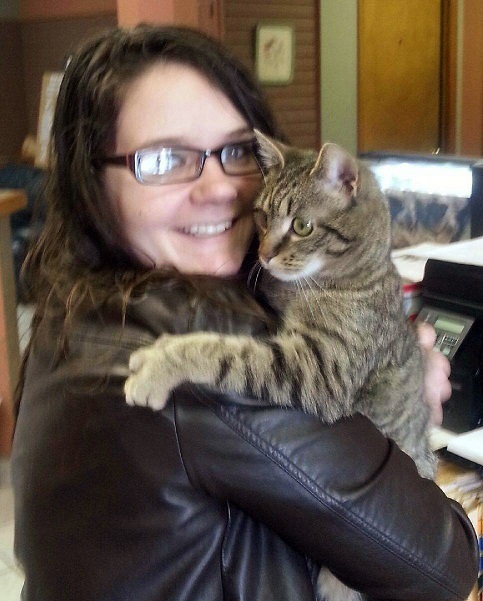 Great job by Cat’s Cradle and Valley Veterinary Hospital, and special thanks to Stephanie Miller for making the happy ending to Rowdy’s Tale a happy new beginning in a loving forever home! If you liked this story and would like to be a part of the next one, contact Cat’s Cradle today! H/T to Matt at Cat’s Cradle for the update and to Stephanie for her kind permission to publish the story. This entry was posted in Cats and tagged animal rescue, animal rescue organization, cat shelter, Cat's Cradle, charity, no-kill, non-profit, North Shore Animal League, Valley Veterinary Hospital. Bookmark the permalink. A very appreciative kitty. It brings joy to my heart to hear such stories of love. Thanks! Cat’s Cradle does a wonderful job helping hundreds of cats find forever homes, but seeing so many go the extra mile to overcome such adversity is especially heartwarming. John, Thank you for the update. I’m so glad that Rowdy found a human to take care of him. What a wonderful news to end my day. /seeker. There’s no better feeling than to save a creature in need. Remember Rowdy Tale that I reblog: seeker says: on April 28, 2013 . This is update from John M. Love happy endings. Thank you, John for the update.